Confession: I have a Mom Bag. Those who were older and wiser than I was assured me that it would happen one day. I refused to believe them. No way. Never. Except one day, it did happen. And somehow, with the birth of each additional child, my purse increased in size. Sure, I have a diaper bag, too. It comes along every time I leave the house with my youngest kids. However, I don't want to take it into every single place I go. I rely on my Mom Bag in those cases. Diapers? Wipes? Snacks? Gum? Activity? 20 pens? Got it covered! I've earned the reputation of bag lady. My husband may scoff at the fact that I carry Children's Benadryl with me at all times, but guess what? That actually came in handy THREE separate times over the past year. Not for my kids, thankfully, but I was able to come to the rescue! Now, everyone who knows me knows that if they need something for themselves or their kids, I most likely have it! My Mom Bag isn't just for my kids. I need stuff, too. 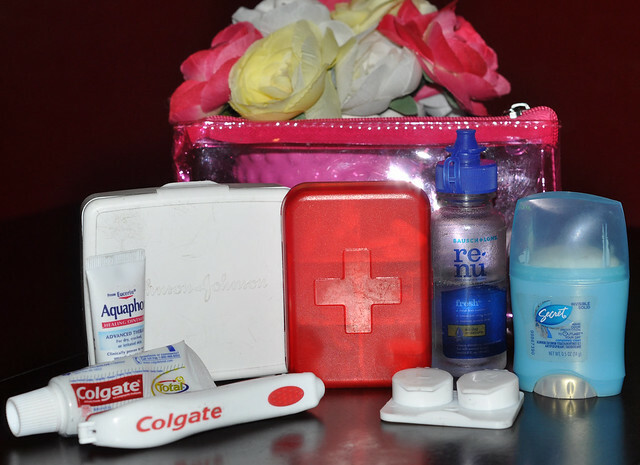 Many unexpected hospital trips or snowed in evenings have popped up leaving me without the necessities, and I'm a person who likes to be prepared for anything! That over-preparation began in 2004, just before Dylan was born. A preterm labor incident sent me straight to the hospital from work. That incident turned into being admitted. I didn't have a single thing with me except my wallet, some gum, and the lip balm in my pocket. I was fed and cared for, but that's where it ended. When the doctor finally said I could leave, and left the room with the comment, "I'm sure we'll be seeing you several more times before this baby was born," I knew I had to prepare myself. As soon as I got home on bed rest, I made a list of necessities and sent my mom to the store. Since then, a toothbrush, toothpaste, contact solution, contact case, deodorant, lotion, lip balm, and a small makeup kit has resided in my purse. Those items came in handy many times over the years! If I'm going to be honest, the amount of items also multiplied. I thought I had it all organized. I had a small bag for everything: one for makeup, one for toiletries, one for hand lotions and hand sanitizers, one for first aid, one for personal products, one for snacks, etc, etc, etc. Our trip to the hospital last week proved otherwise. All those bags were just as bad as loose products at the bottom of my purse. I had to dig through to find the bag I was looking for, and often resorted to dumping everything out. I vowed to remedy the situation, and shortly after we got home, I did some shopping and organizing! First up on the list was replacing my makeup kit. I was so bummed when I went into the bathroom at the hospital to attempt to make myself look less zombie-like, and found out that all that was left was a lip gloss, dried up mascara, and a dried up eyeliner pencil. I'm not quite sure where all my other expensive cosmetics went, but all I had to work with was a lip gloss. Trust me when I say it didn't help much. I decided to make my replacement kit as inexpensive as possible, so I won't feel too bad if the items get old or go missing. 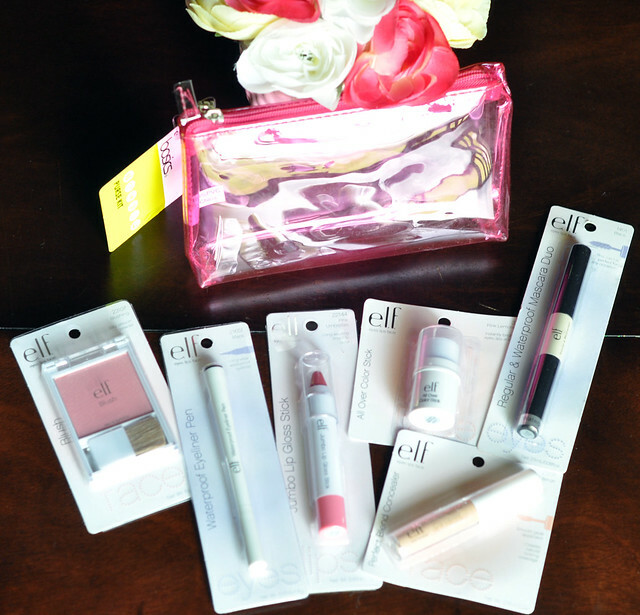 Two of my most used makeup items are from e.l.f. cosmetics: the Waterproof Eyeliner Pen and the All Over Color Stick. Seriously. I love them so much more than all the expensive brands I've tried, and they're only $2 each! (I get them at Target.) 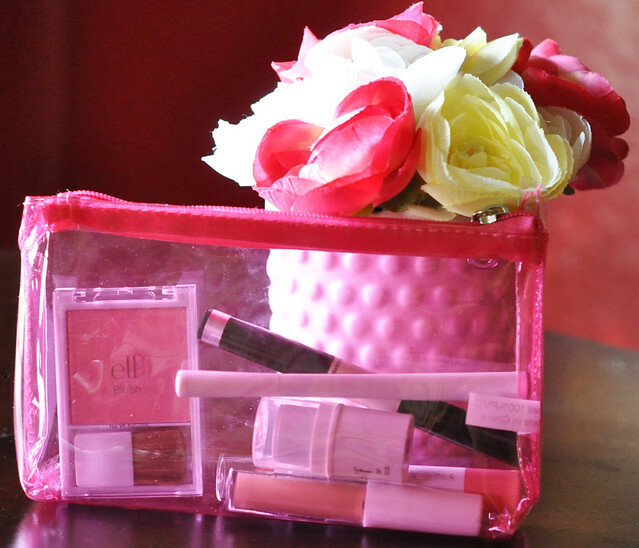 I decided to get both of those for my on-the-go makeup kit, along with an e.l.f. concealer, mascara, blush, and Jumbo Lip Gloss Stick. I picked up a small purse kit for $1.97, and I was set. Grand total for my makeup replacement project? $14!!! Now I have what I need, and I won't be too bummed if it goes missing. Well, except for the eyeliner and color stick. I need a lifetime supply of those! While I was at it, I picked up another, slightly larger purse kit. I dumped out all my mini bags, got rid of items I never used, and rounded up the necessities: toothbrush, toothpaste, contact solution, contact case, feminine products, deodorant, moisturizer, mini first aid kit, and pill box (stupid migraines pop up at the worst times!). It was a really tight fit, but I managed to stuff it all into the bag! Everything I need is now in two see-through bags in my purse. So much easier, and much more organized! I admit it, and I proudly embrace it. I have a Mom Bag. I'm prepared for anything and everything! Just for the record, I'm sure Dylan and Liam are going to put that to the test! That is just too neat for me! LOL. God only knows what you will find in my purse these days! Haha! Like a random straw, gum wrappers, a rock, and 17 pens? I just completed my monthly purse clean out! Ohhh! So organized. My husband calls my bags "trash bags" due to all the food wrappers, empty wipes, receipts, etc. I may have to do this. I love the e.l.f. products, too. Great job, girl! I just cleaned mine out and I admit, it was very much the same as yours!!! I scoffed at everyone recommending the e.l.f. eyeliner pen and color stick, because I didn't think a $2 product would be good. I'm a convert! I definitely have a mom bag too. 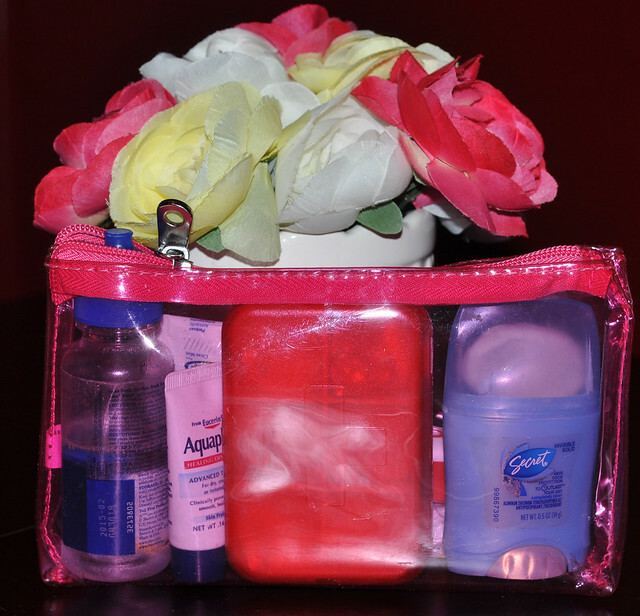 I have mini toiletries in there, tissues, wipes, a pocket knife, a nail clipper, chapstick, bandaids... I need to organize it all though! 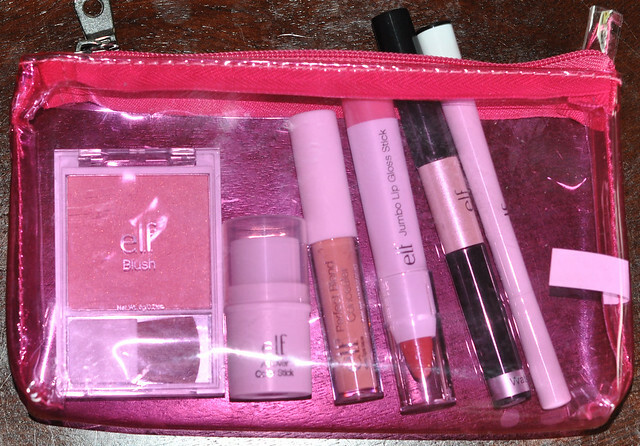 Love ELF cosmetics! So smart to have the toothbrush/deo, etc. I would have never thought of that, but yes you just never know. Haha! I LOVE e.l.f. products. I used to order them online then my local Walmart started carrying them #winning! I actually recently down graded to a smaller purse. Perhaps to small seeing most of the time it is exploding :/. Probably the 15 tubes of chap stick I cram in there.